​Noah Webster's American Spelling Book, better known as the "Blue-backed Speller." This first reader of 1841 introduces children to McGuffey's ethical code. The child modeled in this book is prompt, good, kind, honest and truthful. This first book contained fifty-five lessons. The second reader appeared simultaneously with the first and followed the same pattern. It contained reading and spelling with eighty-five lessons, sixteen pictures and one-hundred sixty-six pages. It outlined history, biology, astronomy, zoology, botany; table manners, behavior towards family, attitudes toward God and teachers, the poor; the great and the good. The duties of youth are stressed. Millions of pioneer men and women were alumni of this second reader college, they were able to read and write English. The third reader was much more formal. It contained rules for oral reading of its fifty-seven lessons. This book contained only three pictures and was designed for a more mature mind, of junior high standing today. ​The fourth reader was an introduction to good literature. It contained British poetry and used the Bible among its selections. This text was addressed to the highest grade in schools, its difficulty compared to that of American secondary schools. It discussed Napoleon Bonaparte, Puritan fathers, women, God, education, religion and philosophy. The fifth reader was designed for elocutionary exercises to increase articulation, inflection, pitch, accent, rate, emphasis and gesture. It contained poetry and prose by Sigourney, Montgomery, Addison, Irving, Young and Byron. In the sixth and final reader of 1885, there were 186 selections, 111 great authors were quoted such as Shakespeare, Longfellow, Dickens and Addison. The theme of the selections included several forms of composition, description, narration, argumentation and exposition. In this book there were also seventeen selections from the Bible. These "eclectic readers" - meaning that the selections were chosen from a number of sources - were considered remarkably literary works and probably exerted a greater influence upon literary tastes in the United States more than any other book, excluding the Bible. In 1841 the original publishing partnership dissolved. The books passed through a series of seven owners while their content evolved during almost a hundred years of publication. Although the revised texts issued in 1857 added the name "McGuffey" to the title, they moved away from the Calvinist values of salvation, righteousness, and piety and reflected the morality and cultural values of a broader American society that had incorporated religion within the civil structure. The 1879 editions taught morality and good character to the emerging middle class and provided children with a common knowledge and worldview. The first editions sold 7 million copies. By 1879 more than 60 million had been sold, and by 1920 over 122 million. In 1978 they were still in use in some school systems. Two of the best known school books in the history of American education were the 18th century New England Primer and the 19th century McGuffey Readers. Of the two, McGuffey's was the most popular and widely used. It is estimated that at least 120 million copies of McGuffey's Readers were sold between 1836 and 1960, placing its sales in a category with the Bible and Webster's Dictionary. Since 1961 they have continued to sell at a rate of some 30,000 copies a year. No other textbook bearing a single person's name has come close to that mark. 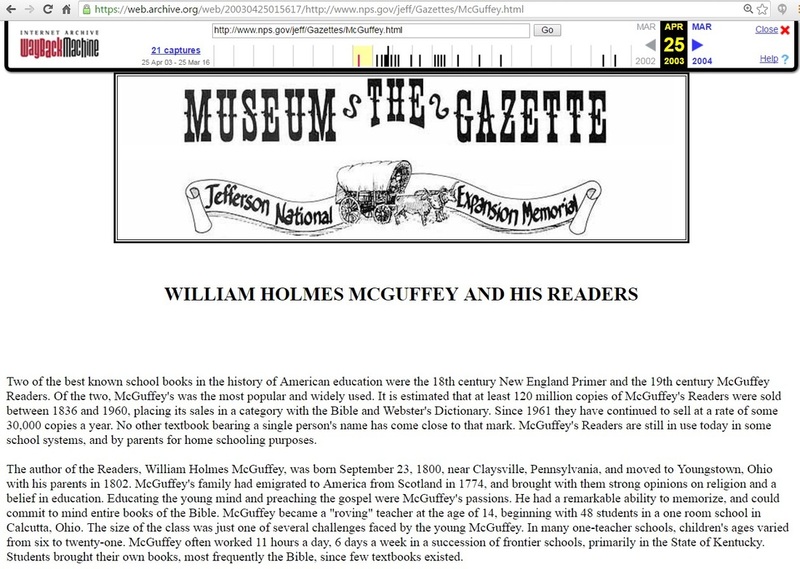 McGuffey's Readers are still in use today in some school systems, and by parents for home schooling purposes. The author of the Readers, William Holmes McGuffey, was born September 23, 1800, near Claysville, Pennsylvania, and moved to Youngstown, Ohio with his parents in 1802. 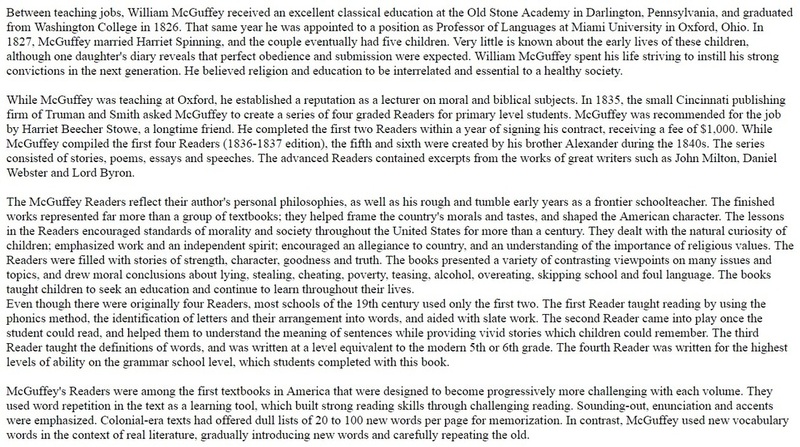 McGuffey's family had emigrated to America from Scotland in 1774, and brought with them strong opinions on religion and a belief in education. Educating the young mind and preaching the gospel were McGuffey's passions. He had a remarkable ability to memorize, and could commit to mind entire books of the Bible. 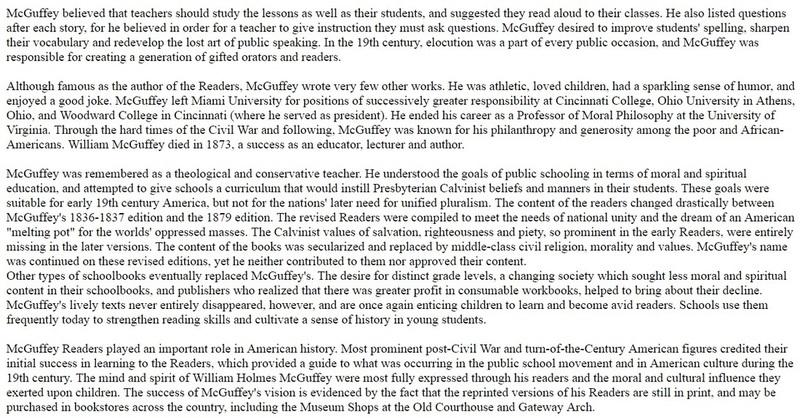 McGuffey became a "roving" teacher at the age of 14, beginning with 48 students in a one room school in Calcutta, Ohio. The size of the class was just one of several challenges faced by the young McGuffey. In many one-teacher schools, children's ages varied from six to twenty-one. McGuffey often worked 11 hours a day, 6 days a week in a succession of frontier schools, primarily in the State of Kentucky. Students brought their own books, most frequently the Bible, since few textbooks existed. Between teaching jobs, William McGuffey received an excellent classical education at the Old Stone Academy in Darlington, Pennsylvania, and graduated from Washington College in 1826. That same year he was appointed to a position as Professor of Languages at Miami University in Oxford, Ohio. In 1827, McGuffey married Harriet Spinning, and the couple eventually had five children. Very little is known about the early lives of these children, although one daughter's diary reveals that perfect obedience and submission were expected. William McGuffey spent his life striving to instill his strong convictions in the next generation. He believed religion and education to be interrelated and essential to a healthy society. While McGuffey was teaching at Oxford, he established a reputation as a lecturer on moral and biblical subjects. In 1835, the small Cincinnati publishing firm of Truman and Smith asked McGuffey to create a series of four graded Readers for primary level students. McGuffey was recommended for the job by Harriet Beecher Stowe, a longtime friend. He completed the first two Readers within a year of signing his contract, receiving a fee of $1,000. While McGuffey compiled the first four Readers (1836-1837 edition), the fifth and sixth were created by his brother Alexander during the 1840s. The series consisted of stories, poems, essays and speeches. The advanced Readers contained excerpts from the works of great writers such as John Milton, Daniel Webster and Lord Byron. The McGuffey Readers reflect their author's personal philosophies, as well as his rough and tumble early years as a frontier schoolteacher. The finished works represented far more than a group of textbooks; they helped frame the country's morals and tastes, and shaped the American character. The lessons in the Readers encouraged standards of morality and society throughout the United States for more than a century. They dealt with the natural curiosity of children; emphasized work and an independent spirit; encouraged an allegiance to country, and an understanding of the importance of religious values. The Readers were filled with stories of strength, character, goodness and truth. The books presented a variety of contrasting viewpoints on many issues and topics, and drew moral conclusions about lying, stealing, cheating, poverty, teasing, alcohol, overeating, skipping school and foul language. The books taught children to seek an education and continue to learn throughout their lives. Even though there were originally four Readers, most schools of the 19th century used only the first two. The first Reader taught reading by using the phonics method, the identification of letters and their arrangement into words, and aided with slate work. The second Reader came into play once the student could read, and helped them to understand the meaning of sentences while providing vivid stories which children could remember. The third Reader taught the definitions of words, and was written at a level equivalent to the modern 5th or 6th grade. The fourth Reader was written for the highest levels of ability on the grammar school level, which students completed with this book. McGuffey's Readers were among the first textbooks in America that were designed to become progressively more challenging with each volume. They used word repetition in the text as a learning tool, which built strong reading skills through challenging reading. Sounding-out, enunciation and accents were emphasized. Colonial-era texts had offered dull lists of 20 to 100 new words per page for memorization. In contrast, McGuffey used new vocabulary words in the context of real literature, gradually introducing new words and carefully repeating the old. McGuffey believed that teachers should study the lessons as well as their students, and suggested they read aloud to their classes. He also listed questions after each story, for he believed in order for a teacher to give instruction they must ask questions. McGuffey desired to improve students' spelling, sharpen their vocabulary and redevelop the lost art of public speaking. In the 19th century, elocution was a part of every public occasion, and McGuffey was responsible for creating a generation of gifted orators and readers. Although famous as the author of the Readers, McGuffey wrote very few other works. He was athletic, loved children, had a sparkling sense of humor, and enjoyed a good joke. McGuffey left Miami University for positions of successively greater responsibility at Cincinnati College, Ohio University in Athens, Ohio, and Woodward College in Cincinnati (where he served as president). He ended his career as a Professor of Moral Philosophy at the University of Virginia. Through the hard times of the Civil War and following, McGuffey was known for his philanthropy and generosity among the poor and African-Americans. William McGuffey died in 1873, a success as an educator, lecturer and author. McGuffey was remembered as a theological and conservative teacher. He understood the goals of public schooling in terms of moral and spiritual education, and attempted to give schools a curriculum that would instill Presbyterian Calvinist beliefs and manners in their students. These goals were suitable for early 19th century America, but not for the nations' later need for unified pluralism. The content of the readers changed drastically between McGuffey's 1836-1837 edition and the 1879 edition. The revised Readers were compiled to meet the needs of national unity and the dream of an American "melting pot" for the worlds' oppressed masses. The Calvinist values of salvation, righteousness and piety, so prominent in the early Readers, were entirely missing in the later versions. The content of the books was secularized and replaced by middle-class civil religion, morality and values. McGuffey's name was continued on these revised editions, yet he neither contributed to them nor approved their content. Other types of schoolbooks eventually replaced McGuffey's. The desire for distinct grade levels, a changing society which sought less moral and spiritual content in their schoolbooks, and publishers who realized that there was greater profit in consumable workbooks, helped to bring about their decline. McGuffey's lively texts never entirely disappeared, however, and are once again enticing children to learn and become avid readers. Schools use them frequently today to strengthen reading skills and cultivate a sense of history in young students. McGuffey Readers played an important role in American history. Most prominent post-Civil War and turn-of-the-Century American figures credited their initial success in learning to the Readers, which provided a guide to what was occurring in the public school movement and in American culture during the 19th century. The mind and spirit of William Holmes McGuffey were most fully expressed through his readers and the moral and cultural influence they exerted upon children. The success of McGuffey's vision is evidenced by the fact that the reprinted versions of his Readers are still in print, and may be purchased in bookstores across the country, including the Museum Shops at the Old Courthouse and Gateway Arch.